The Guardian’s coverage of the culmination of the civil law suit brought by the parents of Rachel Corrie – a verdict which was handed down in Haifa on August 28th, 2012 – was characteristically obsessive, tendentious and breezily unconcerned with the facts. The Guardian’s coverage of the Israeli court ruling dismissing the Corrie’s suit – which included several reports by Harriet Sherwood, a deeply offensive cartoon, and an especially malign piece by Chris McGreal – culminated in an official Guardian editorial, titled ‘Rachel Corrie: A memory which refuses to die‘. However, the Court of Law in Haifa, Israel, which heard the case presented by Rachel Corrie’s family, ruled otherwise. In his verdict, Judge Oded Gershon rejected the claim that Ms. Corrie had been protecting a house from demolition at the time of her death. The mission of the IDF force on the day of the incident was solely to clear the ground. This clearing and leveling included leveling the ground and clearing it of brush in order to expose hiding places used by terrorists, who would sneak out from these areas and place explosive devices with the intent of harming IDF soldiers. There was an urgency to carrying out this mission so that IDF look-outs could observe the area and locate terrorists thereby preventing explosive devices from being buried. The mission did not include, in any way, the demolition of homes. The action conducted by the IDF forces was done at real risk to the lives of the soldiers. Less than one hour before the incident that is the focus of this lawsuit, a live hand-grenade was thrown at the IDF forces. All the above information was provided to Chris Elliott, Readers’ Editor of the Guardian, by my colleague Hadar Sela, in a series of communications beginning on August 30th 2012. Mr Elliott, however, chose not to make a correction, which prompted CiF Watch to bring the matter before the UK Press Complaints Commission. Sela argued that Guardian’s statement that “Rachel Corrie died trying to protect a Palestinian home from demolition” had been proven to be untrue in a court of law prior to the editorial being published. After many months, and a series of correspondences between Sela, the PCC and Guardian editors stubbornly resistant to admitting error, the Guardian begrudgingly agreed to amend their editorial to acknowledge that the Israeli court ruling contradicted claims that Corrie was preventing a home demolition on that day. Whilst the result is far from ideal, it’s important that the Guardian was forced to acknowledge that an Israeli judicial proceeding heard evidence, engaged in serious deliberations, and came to a conclusion at odds with the lethal narratives about the Jewish state routinely advanced by Palestinian activists that the paper unquestioningly accepted as fact in their editorial. Indeed, it’s worth noting anytime the Guardian is forced to deviate from their ‘official line’ on the Israeli-Palestinian Conflict. Sorry, it’s a tragedy she died, but lying down in front of a bulldozer isn’t an accident. It’s Darwinism in action. The modern British version of the Pravda, Guardian is trying to paint the accidental death of a halfwit Jew-hater and wannabe martyr as a war crime committed by an Israeli soldier. Seeing the incessant attacks on Israel and her Jewish citizens in that bigoted, racist, inflammatory and extremist toilet paper, it is more akin to Der Stürmer, surely. I’m going to guess that this grudging correction wasn’t anywhere near as prominent as the original editorial. It’s not actually a correction, either. Nowhere does it say they were wrong, nor is there any apology. It doesn’t even mention the fact that the judicial ruling came BEFORE the editorial was written. It exacerbates the offense by adding in those crucial phrases “An Israeli court accepted…” and “the IDF said…” casting doubt on whether or not the GUARDIAN accepted these facts, proven in fair and open court, to be true. A more mealy-mouthed “correction” has hardly been seen since Orr’s “apology” for her antisemitic “chosen” rant about the Shalit exchange. All props to Hadar Sela for not letting this drop, however. Well done. …and this: “The IDF said their bulldozers were only clearing vegetation and explosives.” A real two for one there! Only clearing vegetation and explosives? Oh, is that all? Brush used to camouflage terrorists is ‘vegetation,’ yes potatoes, I’m sure. And the added bonus of yet another “The IDF said”. No. The court confirmed, not the IDF said. A non-correction correction from a group of mealy-mouthed ne’er do wells. Disgusting. 1) Israeli bulldozers have demolished thousands of Palestinian homes. 2) Corrie was protesting against this kind of action. 3) The house she was in front of was demolished a few months later. What sort of moral victory is it for CifWatch to obtain a ‘correction’ to the effect that the bulldozer that killed Corrie was on that day having a break from destroying homes? 1) Real Madrid have won the European Cup 8 times (I think). 2) Ferguson was protesting against financial doping in football. 3) They do eventually go on to win the Champions’ League “a few months later”. Standards of accuracy are important but not as much as standards of morality. In this case the correction to the accuracy of the story was essentially trivial. If I beat you up on Thursday and you report that the offence occurred on Friday the significant issue is not the date but the beating-up. It would be extremely significant if I reported the beating on the Thursday. That’s the point. It’s all very well saying “well the house was eventually knocked down anyway” but IT HADN’T BEEN and NOR WAS IT THREATENED WITH DEMOLITION when the Guardian said it was. But sencar is implying that the house was being targeted. His comment is both inaccurate and immoral. I wasn’t implying anything of the kind. 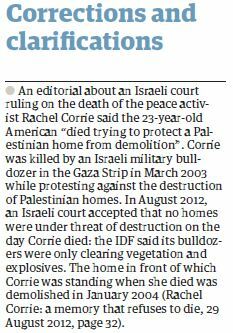 For the sake of argument I (and the Guardian) accept that the bulldozer was doing some gardening on the day of Corrie’s death (although I have no great faith in the honesty of the IDF or the justice dispensed by Israeli courts where Palestinians are concerned). The point is that Israel DOES destroy homes by the thousand, often contrary to international law, and it could easily have been targeting the house in question on the day Corrie died. Also, judging by the number of dead demonstrators around (ISM and otherwise), the IDF has a pretty cavalier attitude towards their safety. You weren’t saying anything of the kind? No? You and the Guardian just have no great faith in the honesty of the IDF or Israeli courts? Oh, well, thanks for clearing that up! Who do you have faith in? ISM and Guardian? So which part of the court’s decision did you disagree with “perfessor”? I’ll bet it was the part that didn’t comply with international law. That’s where all your expertise is, no? It could have been targeting the house on that day? Now I understand. So while standards of accuracy are important, your now spending all your time arguing that there was no accuracy. A bullshitter supreme you are. I know you have much more faith in the Protocols Sencar. Yes they are unlawfully destroying the homes of Palestinians and Israeli settlers built without proper permits. Also, judging by the number of dead demonstrators around (ISM and otherwise), the IDF has a pretty cavalier attitude towards their safety. I agree that their attitude is exceedingly cavalier taking into account that their job is to protect the Israeli civilians and not your terrorist friends. Perhaps you would prefer the kind of “justice dispensed at the “court” operated by the UK Socialist Workers Party. I simply prefer justice that is even-handed. Despite the occasional finding in favour of Arabs/Palestinians Israeli justice certainly isn’t that. Sencar I see now you become a law expert who is familiar with the actions of the Israeli court system. Your transformations are amazing…Or maybe… maybe simply you are an ignorant libelous Israel hater? By the way sencar, the phrase “by the thousands” means thousands at once. Is that what you meant to say? Do provide some proof. Sencar, you are just another bigoted British colonialist, thinking you know better than the Israeli court (full of clever Jews you can’t trust). But they can’t pull the wool over your anti-semitic eyes can they?You know a victim of the Jews/Zionists when you see one. Destroy homes by the tousand? where? In the case of journalism accuracy is what it’s about and deliberate innaccuracy is immoral. …and it’s not a case of Thursday and Friday is it? What kind of “moral victory” was it for ISM and friends (The Guardian et al) to create and promulgate a hoax, lying to the entire world, that this thoroughly misguided young woman was the victim of anything but the corrupting propaganda of her handlers resulting in an unfortunate accident in a closed war zone while being used to protect the worst kind of scum from interference with their own schemes at murder and mayhem? Wow, Jeff. Tis a pity I can only recommend this post once! The smart people are complimenting me. Let’s hope it doesn’t go to my head! There are lots of pictures of where she died. The only house she could have been in front of is in your imagination. I understand your pain caused by the bulldozers destroying hideouts used by your friends to launch rockets at Sderot and RPG’s at Israeli school buses. Hopefully you will have more occasions in the future to mourn and shed more crocodile tears. Congratulations to CifWatch for getting the Guardian to retract. It truly is a lying propagandist organ, whose disdain for the truth is reflected in its falling circulation and diminishing profits. Please keep exposing their lies and their anti-Zionist agenda. An other view on Rachel Corrie as a wannabe Hitler-Jugend exploited by the Palestinian terror organisations, their Western supporter the ISM and their apologists like the oh so liberal Guardian. You speak of morality , when the very reason why the bulldozer was there in the first place was to clear the scrubland of IED and the means of concealing them as well as hiding places for snipers .